The Community Miracles Center (CMC) was formed in 1987 to serve the teaching, learning, and healing needs of A Course In Miracles everywhere. It's office is located in San Francisco, California, U.S.A.. The CMC maintains a large web site which is a repository of information about A Course In Miracles and contains many articles written by various ACIM authors. It also contains a large list of FAQs about and the Miracles Community of students and teachers. Click on the CMC logo to the right to open a new window with their web site. The CMC has published a monthly, paper periodical that is distributed through U.S.A. and international postal systems since the CMC formed in March of 1987. 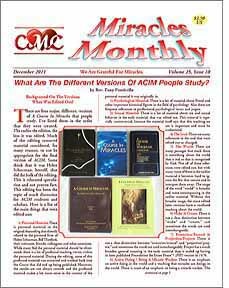 Sample issues are sent with every order from the CMC's ACIM Store. Miracles Monthly is printed in full color and varies between 12 to 16 pages each month. If you would like to subscribe to MiraclesMonthly click on the image of a cover to the issue that is to the left. The CMC hosts large international ACIM conferences. The next one will be held in Boston, MA, U.S.A. on May 23, 24, 25, & 26 2019. 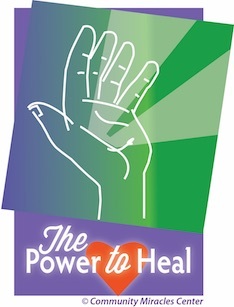 The name of the conference is "The Power to Heal." These conferences are four days of gatherings, workshops, lectures, meals, joining, and fun. A dance is held on Saturday night. The Boston event is being held in the downtown, Boston close to many major Boston historic tourist attractions attractions. We will be in the famous Omni Parker House Hotel on Olive Street. The Omni Parker House is the longest continually operating hotel in the United States over 166 years. Click on the conference logo to the right to go to a web page with more information about the conference. We will be organizing many tourist excursions before and after the conference so plan to make a vacation of your time in Boston. The Community Miracles Center is a local and worldwide fellowship. We share our experience of A Course In Miracles and other related spiritual teachings in order to heal our perception of ourselves, our relationships, and the world.